Get your Robart Pinchless Large Dee Corkscrew Snaffle Bit and Pinchless Snaffle Bit products today made of unmatchable craftsmanship. Get your horse only the best Robart Pinchless Dee Snaffle Bit on the market. We know how difficult it can be to find a good deal on Dee Snaffle Bits made of unsurpassable craftsmanship. 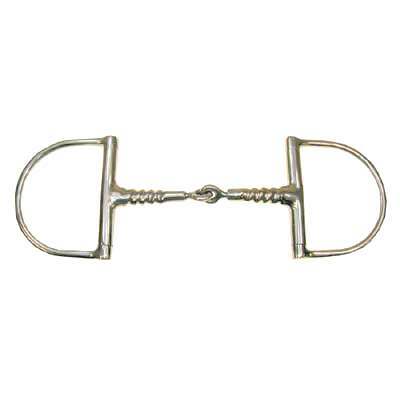 This Robart Pinchless Large Dee Corkscrew Snaffle Bit measures 2.5'' x 3'' rings and 13mm in the mouth. This Pinchless Snaffle Bit also uses pressure instead of pain to train. We only offer the most asked for Robart Horse Bits for your Horses. As horse enthusiasts ourselves our number one priority is to offer our customers Pinchless Snaffle Bits which we believe are made to last and available at affordable prices.